Admired by some, condemned by others, and feared by all, the military might of the West is undeniably colossal. 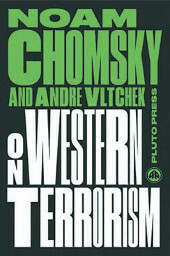 In On Western Terrorism, world-renowned intellectual Noam Chomsky discusses Western power and propaganda with filmmaker and investigative journalist Andre Vltchek. Beginning with stories of the New York newsstand where Chomsky started his political education as a teenager, the discussion broadens out to encompass colonialism, imperial control, propaganda, the Arab Spring, and drone warfare. Chomsky and Vltchek offer a powerful critique of the legacy of colonialism, touching upon many countries including Syria, Nicaragua, Cuba, China, Chile, and Turkey. Updated with a fresh design and a new foreword by Chomsky, On Western Terrorism remains an influential and powerful critique of the West’s role in the world, inspiring all who read it to think independently and critically. Noam Chomsky is a world-renowned linguist and social critic. He is Institute Professor in the department of linguistics and philosophy at Massachusetts Institute of Technology and the author of many books published by Pluto Press, including Fateful Triangle, Rogue States, and Power and Prospects. Andre Vltchek is a writer, filmmaker, and investigative journalist. He is the author of several books including Oceania, Western Terror: From Potosi to Baghdad, and Indonesia: Archipelago of Fear, published by Pluto Press. Atlantis. Lemuria. Mu. Eden. These famous names always bring to mind fantastic images of sprawling, flourishing civilizations and idyllic, utopian climes. But did they exist? The established archaeological community would be quick to respond with an emphatic no. But more and more experts are coming forward now–in addition to those who have been fighting to make their voices heard for decades–declaring that, yes, these places did, in fact, exist in some form.The world is forever and always changing. Ocean levels have risen and fallen innumerable times over the millennia. We are just now realizing how even a seemingly minuscule change in sea level can completely alter the way we live. So why is it so difficult to believe that there once existed vast and glorious cultures that, along with their knowledge and histories, were lost to the sands of time or the depthless waters of a great flood? 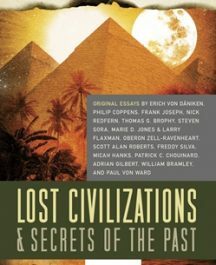 Most people cite a lack of any tangible evidence to support this idea, but what they don’t know (or refuse to know) is that there IS evidence.This collection delves into many questions concerning these lost civilizations, including their sometimes gigantic and otherworldly inhabitants, their possible contact with advanced beings and aliens, their religions, and other lost knowledge from a past we all share. With no past, we can have no future. There is more to history if you know how to look at it and where to look. Let these experts show you the way. Michael Pye has been an acquisitions editor for New Page Books since 2003 acquiring hundreds of books in that time. He developed a healthy appetite for the unexplained by watching far too many episodes of In Search Of hosted by Leonard Nimoy after school instead of doing his homework, which turned him into a reader of books on the strange and unexplained. He earned a BA in English from Southern Connecticut State University. Senator John McCain has always gotten a free ride from the Controlled Media in America. He’s been a regular guest, more than any other member of Congress, on the weekend chat shows, and he’s always portrayed as a “reformer.” Even more so, the average American is convinced that McCain is a “war hero” who’s popular among his fellow former prisoners of war (POW) and among the families of America’s POWs and those still missing in action (MIA). This shocking book from two experts demonstrates otherwise. 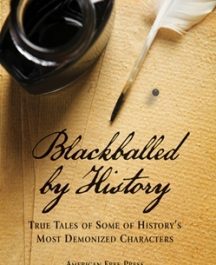 Co-authored by a career military man, retired Army Sergeant John “Top” Holland, and his coauthor Rev. Patrick Bascio, PERFIDY: The Government Cabal That Knowingly Abandoned Our Prisoners of War and Left Them to Die is the incredible story of how high-ranking U.S. government officials in the diplomatic and intelligence communities, along with certain elements in the military, have actively collaborated to cover up the fate of American POWs and MIAs. 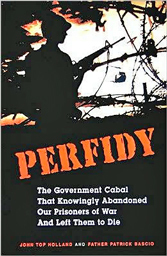 And as the authors demonstrate beyond any question, McCain, himself a former POW, has been perhaps the most adamant roadblock on Capitol Hill in getting to the truth about the POW/MIA controversy.